India’s health care system has improved notably over the past few decades. Many deadly diseases like small pox have been eradicated with the advent of advanced medicines, vaccines and modern treatment facilities. However, there are still some deadly ailments which are responsible for nearly 60% death in India. Not only these diseases are difficult to treat but the cost of treatment is also quite high and often beyond the reach of common people in India. Why Health Insurance is Important to Combat These Lethal Diseases? As mentioned earlier, treatment expenses of critical ailments are increasing by leaps and bounds with each passing day. For most Indians, treatment costs are out of pocket expenses and treatment any of these diseases in private facilities more often than not burn a huge whole in their savings. Health insurance plans in India cover a wide range of diseases and conditions and provide policyholders with the much-needed financial shield in case of an emergency or planned hospitalization. 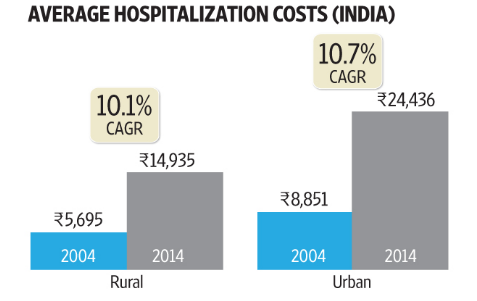 Over the last decade, hospitalization costs have raised drastically both in rural and urban areas of the country. And, comprehensive health insurance plans seem to be the only way to cope with such massive expenses. According to the survey conducted by the National Sample Survey Office (NSSO) in the first half of 2014, treatment costs have increased at a rate of more than 10% both in urban and rural India over the past decade. The impact of ever-increasing cost of healthcare in India is even more severe in case of major ailments. Life-threatening diseases can financially drain middle-class families with limited affordability. This grave situation well and truly triggers the need of a quality health insurance plan. If you take care of your family you should start seriously consider availing a Family Floater health insurance online policy in India. You can also avail critical illness policy which provides a lump sum amount on the diagnosis of covered critical ailments. Most of the deadly diseases mentioned above are covered by critical illness online plans in India. Regardless of whether you would buy health insurance for your family or for yourself, you should buy health insurance online early; when you are young and healthy. The benefit of buying health insurance below the age of 40 ensures that you will have to pay fewer premiums as your health risk is also less. Furthermore you don’t have to go through medical-check-up and hence there is no fear of rejection. Let’s take a look at some of the most suitable health insurance online plans in India that covers the treatment cost of the India’s most deadly diseases. With growing demand for comprehensive coverage for life-threatening ailments, health insurance companies have come up with new range of health insurance online plans that are designed particularly to cover a specific disease. Star cardiac cover is a disease-specific health insurance plan by Star Health to cover the expenses of treatment of cardiovascular diseases. The health plan covers hospitalization expenses due to complications related to cardiac. 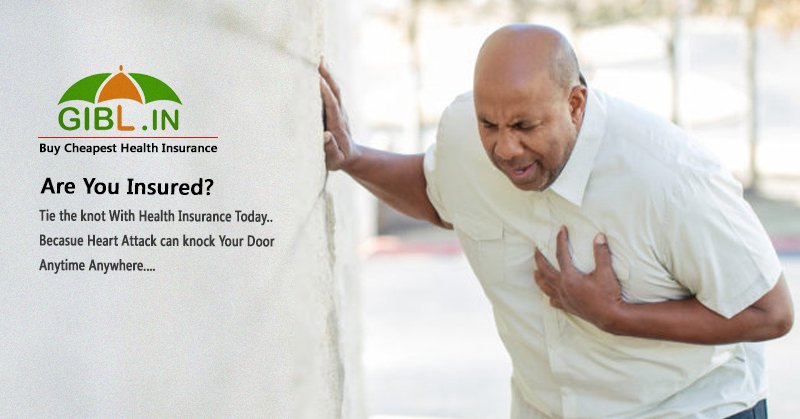 Aside from hospitalization expenses, the Star Cardiac Cover also shields pre, post hospitalization costs, ambulance costs and over 405 day-care treatments. The advantage of availing Star Health insurance plan online is in-house claim settlement which is smooth and effortless. Furthermore, you can also avail cashless facility in a huge network of over 6000 hospitals across India. The premium of Star Cardiac Cover depends on the variant. The Gold Plan and the Silver Plan with Rs. 3 Lakh Sum Insured costs Rs. 29,900 and Rs.20,700 respectively for 35 years old person residing in Kolkata. Religare Health Assure is one of the best critical illness insurance plans when it comes to cover the treatment cost of respiratory diseases. This health policy covers End Stage Lung Disease including Chronic Interstitial Lung Disease. However, the disease must be diagnosed by a chest physician and the coverage is effective for some specific medical criteria are met. Tuberculosis is one of the very few diseases in India for which no specific health plan is yet to hit the market. At present, the claim for TB is negligible in India’s health insurance landscape. Most reputed health insurance companies in India receive very little claim for TB. For example, 5% of total claims received by Star Health is for TB, for insurers like United India Insurance, Bajaj Allianz the claim is just about 1%. However, with the growing incident of TB cases, health insurance companies in India would soon come up with a new policy for Tuberculosis. In 2011, India had the highest incidence of a whopping 2.2 million TB cases out of the 9.6 million cases globally in 2011. In 2015, this number increased to 2.8 million in 2015 according to World Health Organization data. In past three years, claims reported for TB at Bajaj Allianz has grown at a rate of 2% CAGR. And, 7% growth is observed in the average claim size in past three years. Many critical illness plans cover also advanced stage cancer. However, the downside is the coverage is on only if the malignant tumour shows uncontrolled growth which is invasive and destructive to normal tissues. For benign tumours, there are many critical illness policies available such as Critical Illness Platinum Insurance Policy offered by HDFC ERGO policy. However, the benign Brain Tumour must be diagnosed by the specialist Medical Practitioner and there should be enough evidences in the findings of MRI and CT Scan of the brain. And, the coverage is effective only if the tumor leads to permanent neurological deficit. The above premium chart is for 1 year plan for a 34 years old person living in Kolkata, West Bengal. Digestive diseases are of many types and most are covered by health insurance plans in India if required 24 hours of hospitalization. Now that you know that even deadliest of diseases in India can be tackled without having to shell out all of the savings by availing a health insurance plan, it is high time you should also avail one. Apart from providing the much-needed fund to treat fatal ailments, these online health insurance plans also cover pre, post hospitalization costs, ambulance costs, cost of a host of treatments that don’t require 24 hours of hospitalization. Furthermore, you can make the most of the cashless facility by getting admitted in any hospital in the network of your chosen insurer. To buy critical illness policies online you can visit GIBL.IN, the premiere online insurance marketplace. You can compare buy and renew health insurance online plans on GIBL.IN within a few minutes. Deadly diseases are spreading very fast and cost of treat is also rising and you are also not getting younger. So, don’t delay and visit GIBL.IN today to compare health insurance online to buy the best plan as per your requirement and budget.